One of Australia and New Zealand’s leading leasing and fleet management companies, FleetPartners keeps over 50,000 vehicles on the road. From a multi-national corporation looking for a corporate fleet to a small business looking for ten vehicles, right down to the individual driver looking for personal vehicle financing solutions. 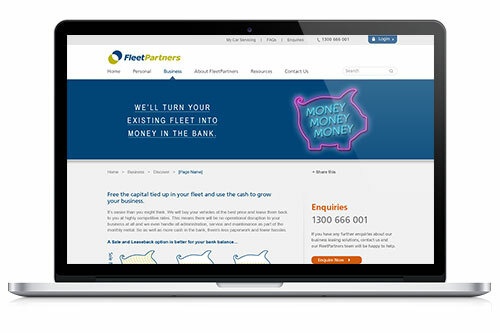 We’ve built a huge number of eDM’s, Landing pages, tiles and banners for FleetPartners. Each campaign comes with different requirements and styles and generally a different target audience. The site is built on Umbraco which means a bit of .asp development is involved which we love to do.